Face the high-octane thrills of a professional race car driver on 1.8-mile (2.9 km) track for four adrenaline pumping laps at the world famous NOLA Motorsports Park. Our racetrack experience gets you behind the wheel of a Porsche 911 GT3, Lamborghini Huracan LP610-4, or the insanely smooth-handling Ferrari 458 Italia. Push yourself to the limit while driving a high-speed vehicles or ride shotgun with your own professional instructor. Height, weight, and age restrictions apply. Ever wanted to race an exotic sports car on a professional racetrack? Make that dream a reality at the NOLA Motorsports Park outside of New Orleans. 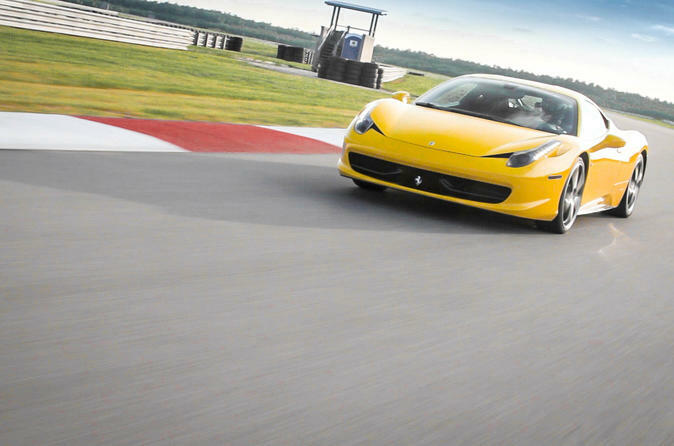 Make your own way to NOLA Motorsports Park in New Orleans to begin your experience. Located less than half an hour away from the New Orleans French Quarter, this adrenaline pumping thrill-ride offers an amazing opportunity to test out two of the finest exotic cars found anywhere in the US. First, choose between two supercars: the Lamborghini Huracan LP610-4 and the Ferrari 458 Italia. Then, decide whether you’d like to drive yourself or ride shotgun alongside a professional instructor. The park’s 1.8-mile (2.9 km) tract consist of 12 turns and a 3,200 ft. straightaway, giving you the fastest supercar experience in North America. Before jumping behind the wheel (or hopping into the passenger’s seat) you’ll receive a brief instructional class to help you stay safe and informed. Then, you’ll embark on a full training lap. Afterward, it’s time to accelerate to heart-pounding speeds as you and your instructor test these high-performance vehicles in the environment they were actually designed to tackle, reaching top speeds 100 MPH +.